Poznań-based rolling stock supplier, Modertrans, officially presented the first Moderus Gamma tram, ordered by the public transport company of Poznań, MPK Poznań. The first tram was already sent to the Franowo depot in Poznań. Under a contract with MPK Poznań, Modertrans will deliver 50 new trams of which 30 unidirectional trams and 20 bi-directional. Each vehicle has 56 seats and has a total capacity of 240 passengers. The tram has places for wheelchairs and a stand for safe bicycles. The tram is equipped with recovering energy system and has a total power of 544 horsepower. All vehicles will be adapted for the installation of supercapacitors. 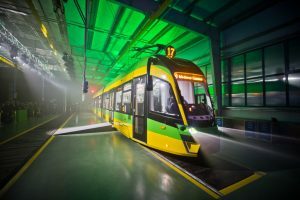 The tram is manufactured with modern materials and technology, which allow better tram traction performance, reduced weight and consequent reduction in track wear and reduce the level of noise emitted. The new trams will have seven doors which will ensure quick and efficient exchange at stops. The proper temperature in the tram will be provided by automatic 6-zone heating and automatic 3-zone air conditioning. All trams will be equipped with a dynamic passenger information system and advertising monitors. The project on the acquisition of the new trams is financed under the Operational Program Infrastructure and Environment. The total cost of the project is PLN 450.3 million (EUR 104 million), and the value of its eligible costs is PLN 366 million (EUR 84.6 million). The co-financing awarded to this project is currently PLN 50 million (EUR 11.55 million). The total value of the project also includes financing for the acquisition of 10 additional Moderus Beta trams, ordered in 2016.